Comments: Peregrine falcons have never been common in North America. There may have been as many as 10,000 pairs in the early 1940s. Their population crashed in the 1950s due to the chemical DDT, which caused eggshell thinning and reproduction failure. In 1972, DDT was banned but the population had dropped to less than 325 nesting pairs. Conservationists, falconers and government agencies united to carry out one of the largest recovery and restoration project ever attempted. Now there are an estimated 3,000 breeding pairs in North America. They were removed from the Federal Endangered Species list in 1999 and the Kansas Endangered Species list in 2009. Distribution: Peregrines occur on every continent except Antarctica in very diverse habitats. Tall cliffs are their preferred nesting sites but some are adapting to the “artificial cliffs” of tall buildings. They have nested in Topeka and are regularly seen in downtown Wichita. Look for them near mudflats and open water throughout the rest of Kansas. 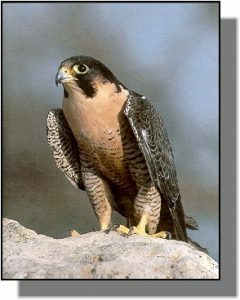 Food: Peregrines have a highly developed design for pursuit and capture of flying quarry; they are the fastest animals on record! They can fly 75 mph in level flight but their stoop, reaching speeds of over 250 mph, is the maneuver that thrills anyone privileged enough to witness it. Their preferred foods include many different kinds of birds, including waterfowl, shorebirds, pigeons, doves, flickers and meadowlarks.